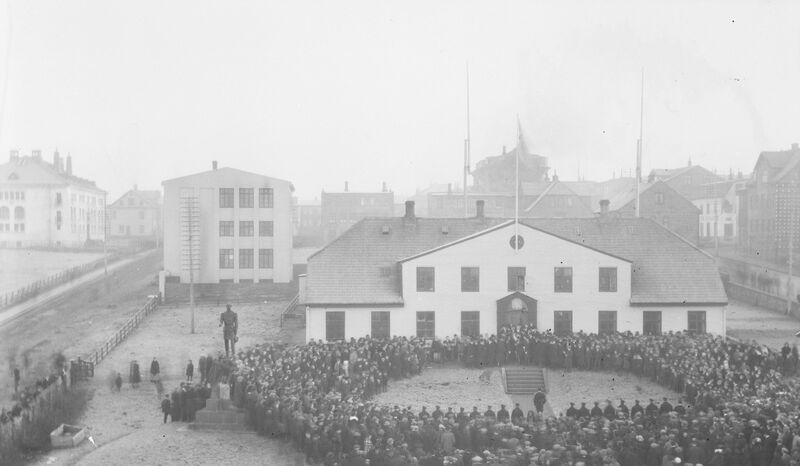 The ceremony in front of Government House in Reykjavik on 1 December 1918. Three of the authors of the book published by AB were there: David Stefansson, Gudmundur G. Hagalin and Tomas Gudmundsson, all turning against the communist threat. Iceland became a sovereign state on 1 December 1918. On the 100th anniversary of Icelandic sovereignty, 1 December 2018, RNH Academic Director Professor Hannes H. Gissurarson published a paper in Morgunbladid. He argued that ever since the foundation of the Icelandic Commonwealth in 930 Iceland had been a sovereign state in a Hegelian sense, as a unifying force, a meeting ground for mutual adjustment. The 930–1262 Commonwealth had been an interesting example of law without government. But Iceland only became a sovereign state in a Weberian sense, as an institution with monopoly of coercion, on 1 December 1918. For decades after that, the sovereign Icelandic state had been threatened by a revolutionary party backed by a foreign totalitarian state: Local communists had fought for what they themselves called Soviet-Iceland, gaining more electoral support than comparable parties elsewhere: 19.5% in the elections of 1946 and 1949. Some distinguished poets and novelists had however confronted them and criticised their attempts, financed by Moscow, to control Icelandic culture: Tomas Gudmundsson, Gunnar Gunnarsson, Kristmann Gudmundsson, Gudmundur G. Hagalin, Sigurdur Einarsson in Holt, and David Stefansson from Fagriskogur. On the 100th anniversary of Icelandic sovereignty, the Public Book Club, Almenna bokafelagid, published speeches by them, In Defence of Western Civilisation (Til varnar vestraenni menningu), edited and annotated by Gissurarson. Against fierce opposition from local communists, Iceland had enjoyed the protection and support of the United States from 1941 onwards, enabling her in 1952–75 to extend the fisheries limits from 3 to 200 miles, a crucial move for a small nation with little natural resources other than fertile fishing grounds. However, the ‘American Age’ of Icelandic history had come to an end in 2006 when the US military base in Keflavik was closed. After this Iceland has had few friends, as was amply demonstrated during the 2008 bank collapse. Icelandic leaders seemed also to have lost their self-esteem, as was shown by their appeasement of foreign powers in the Icesave dispute. Gissurarson suggested that one reason might be how the Icelandic struggle for independence had been denigrated in modern textbooks. More than two generations of Icelanders had been indoctrinated in schools against the deep and strong national sentiment of the Icelanders, which had found political expression in the foundation of a sovereign state in 1918. Gissurarson’s paper forms a part of the joint project of RNH and ACRE, the Alliance of Conservatives and Reformists in Europe, on ‘Europe, Iceland, and the Free Market’.